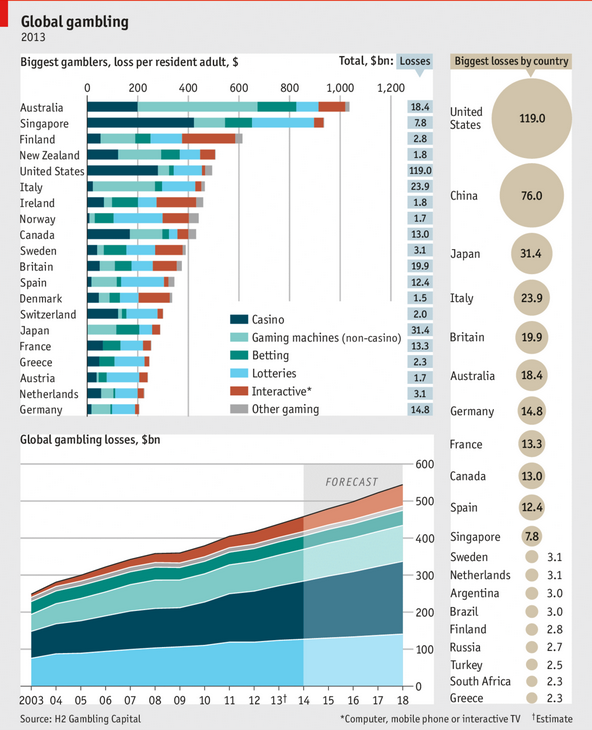 The chart below shows gambling losses by country around the world. Gambling is a topic that fascinates me because it provides an excellent controlled environment to study the psychologically of the participants (information which can be directly correlated to the world's largest casino: the financial markets). You can see in the graphic below that the United States leads the world in total losses. This would be an obvious conclusion considering they have the largest total amount of money to gamble, and the largest pile of money gambled always leads to the largest total losses. The bars on the left provide a better look at the individuals that exist within those countries. It shows that Australia absorbs the highest level of losses per person, and they lose an enormous amount of that money at casinos and gaming machines. I always assumed that this title would be held by an Asian country where citizens are notorious for their love of gambling (Singapore is a close second). For more on this topic see: The House Always Wins: But How Much? Who Is The Real Belgium Buyer Of U.S. Treasuries?